ATZ asked Coney Island artist and rogue taxidermist Takeshi Yamada what he is bringing to tonight’s 5th Annual Carnivorous Nights Taxidermy Contest presented by the Secret Science Club at Bell House. Last year, Yamada was awarded “The Most Twisted Prize” for his family of freak show babies made from his own skin. In 2006, he won the Grand Championship of Taxidermy for his 6-foot-long mummified Fiji Mermaid. 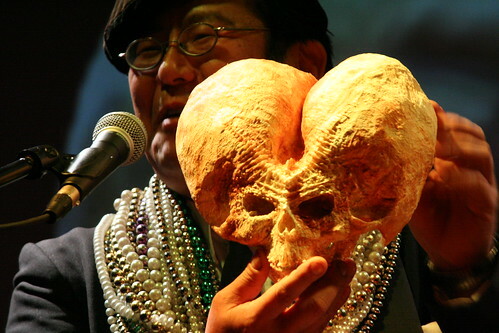 “I am planning to bring several freak skulls for the contest,” Yamada confided to ATZ. “Here is an example. I do not want to spoil the fun by showing all of them.” If you plan to go to cheer on Coney’s very own rogue taxidermist, get there early and bring your camera. 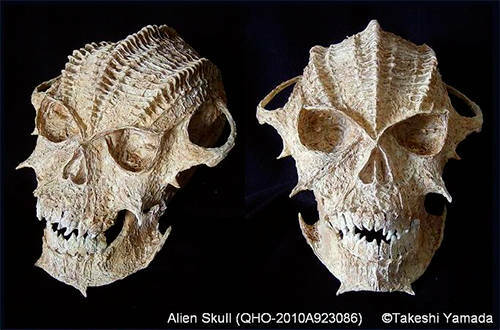 Later this week, we’ll update this post with links to photos of Yamada’s collection of alien skulls. The Japanese-born artist and Neptune Avenue resident is one of Coney Island’s most recognizable eccentrics. In the summer, you’re apt to find Yamada clad in a black tuxedo and Mardi Gras beads strolling the Beach and Boardwalk with his taxidermied sea bunny Seara. If you haven’t seen Yamada’s long-running “Museum of World Wonders: Cabinet of Curiosities” yet, the exhibition is on view through Dec. 31 at the Coney Island Library. The Secret Science Club presents the 5th-annual Carnivorous Nights Taxidermy Contest, Tuesday, December 7 at Bell House, 149 7th St. (between 2nd and 3rd Aves) in Gowanus, Brooklyn. Doors and Pre-show at 7:30 pm, Taxidermy contest at 8:30 pm. $5 cover charge. 718-643-6510. Subway: F to 4th Ave; R to 9th St; F or G to Smith/9th. Mr. Yamada of two-headed-baby renown was a heavy favorite for this year’s top prize. He strutted on stage to James Brown, wearing a black suit and felt beret, his neck heavy with Mardi Gras beads, and displayed his collection of meticulously fashioned, Hollywood-caliber “space alien skulls,” which he called a “creative interpretation of rogue taxidermy.” The crowd roared in approval.